Pros: This motherboard booted up perfectly the first time it was installed. The bios is really easy to understand and I was easily able to overclock an Athlon 64 X2 2.6 GHZ processor to 3.1 GHZ using the bios. Cons: One of the RAM slots did not work. The first RAM slot would hold 2 GB as promised, but the 2nd slot failed to work. I didn't need the slot anyhow so there was no since in RMAing it, but be aware of that. Other Thoughts: I build PCs for a living, I personally would look for a different model of the same price before I went with this one. It could have been a rare fluke with my motherboard, but I won't risk it on a customers computer. However if this is the only option available to you or it's the cheapest option it is a decent board. Pros: Built two as first PCs for my grandsons- worked out of the box Ubuntu 8.10 Intrepid Ibex onto 80 gb HDD. Paired with AMD Sempron 3800. 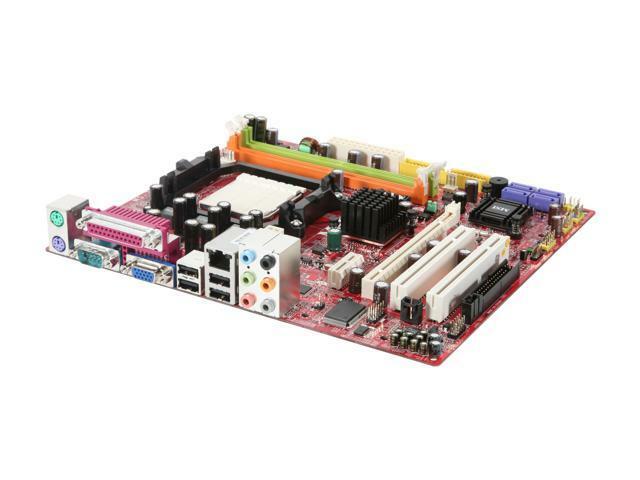 Has 4 SATA ports on board. Video is acceptable and Ubuntu Linux drivers work fine with. Other Thoughts: Installed the two K9A2GMs into Apevia's Q-Pack cases. Fine combo. Was able to have two complete computers for <$800. UPS delivered right to my front door two days earlier than I thought they would: ANother perfect combo: Newegg and UPS! Woo Hoo! Pros: Great budget board that has legacy ports (PS/2, parallel, serial, VGA), loads of useful features and has headroom for future upgrades. The Northbridge heatsink is burning hot to the touch if not actively cooled. Other Thoughts: If I had to nitpick, this board does not have those solid capacitors that most new boards do but I am not surprised since this is an older board. As long as you dont care about S3 and have active cooling on the Northbridge, you will be satisfied with this board. Pros: Dirt cheap. Easy to setup. Works successfully with Crucial 2GB RAM sticks (PC6400, 800Mhz) X 2 for 4GB RAM total. Paired with a Brisbane X2 2.3Ghz processor, scrounged a case and pre-existing power supply - makes for a great zippy little extra PC for my girlfriend who does not game. Cons: none really. Very pleased. Other Thoughts: You probably could game on it OK for the somewhat older titles if you got a decent GPU. I bought a Rosewill PCI IDE card so I could use up some old PATA drives. I didn't buy this for a bleeding edge flagship PC. Just wanted something quick, reliable, inexpensive and pain-free. Here it is. Pros: Easy install, no quirks, no customer complaints. Board seem solid and performs well. Cons: Could use a 2nd IDE port.